Published October 6th, 2008	in Business: Strategy. 5 Comments	Tags: Cash-Back, Microsoft, Search. 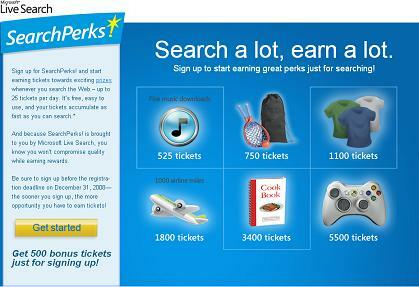 Microsoft moves further down the road of buying its way into the search dominance (check out Live Search Cashback they launched back in May) with October 1 launch of a new loyalty points program - Search Perks. The idea is very simple: search the web with Live Search and get a point for each search (up to 25 a day) which you can exchange for prizes come April 15, 2009. You currently get 500 points just for signing up - enough for a few music downloads or a deck of play cards. The program is open to US residents only. You will need to install a small internet browser add-on. You can’t use it on any other browser but IE. Encouraged by the free stuff, I initially considered giving Live Search a try, but the browser restriction killed it for me right there. IE is simply no match to Firefox and shuffling two browsers for different tasks is just too much. That’s where User Agent Switcher, a firefox add-on/plugin, comes in! Oh, I realized, you need the MS Browser for the Counter that SearchPerks installs. They give you 500 pts for signing up. The Xbox 360 controller costs 5,500 pts. This leaves 5,000 pts to be earned. At most you can get 25 pts per day. 5000/25 = 200 (days to get enough tickets). 200 days from 10/1 is 4/19. The contest ends on 4/15. There is no way anyone could obtain enough tickets to purchase the controller. Shame on Microsoft for misleading consumers! Hey Geezus – are you illiterate? 2. The controller is 4500, not 5000. Shame on Microsoft? Looks like you’re just another idiot jumping to conclusions w/o reading the promotion.